As you all know by now, I'm a huge fan of the unconventionally pretty, which is not to say, in so many words, the downright ugly. I like things to have a hard edge, sometimes, and to make you work to see how beautiful they are. The easy beauty of pink roses and sunsets is one thing; the difficult, ornery, belligerent beauty of rough concrete and sheets of rain is another. This fabric wants to be a narrow 'secretary' dress with a round collar, midriff band, and contrast piping (and, thanks to Lydia, I actually HAVE this pattern right now) but I don't know when I'll get a chance to make it. I'm pretty overwhelmed with Actual Work at the moment. Making a new dress is starting to feel as far away as some of my other nebulous goals, like "lose fifteen pounds" and "answer all my email" and "live on Moon colony before I die," and having "make new dress" slip into that category is a bit depressing. Under the subjects of serendipity and Great Minds Think Alike, I have that fabric too! The “i”‘s look more like “!”‘sI think it’s “Vegas!”…..
That fabric is mesmerizing. It’s like alpabet soup, I keep trying to find words. I thought I saw “veggies”. Your description of hard-edged beauty ddefinitely resonated with me. I adore the crumbling, decaying buildings downtown in my city… I don’t think I’ve ever thought of a way to describe the aesthetc before.I also adore that fabric. I want to make a blouse from it. Do you know of a source for it online? i’m loving the phrase “charmingly grotesque”. something about it resonates with me and my aesthetic. GOOD ONE. I ran the letters through http://www.unscramble.net/ and the only word it made was “visage”. But that doesn’t take into account doubled letters. The S is more prominent in the pattern than the other letters. I too often chose the thing with the harder edge, not as obvious beauty so that it will grow on me. Otherwise, I may grow tired of it. OMG. Want, want, want some of this! And I don’t usually wear anything in the black/white/grey palette. Please, someone, post where I can buy some online. How big are the letters? I’m thinking I would like them at a nice medium as opposed to huge or tiny. It’s a CAPTCHA in dress form! 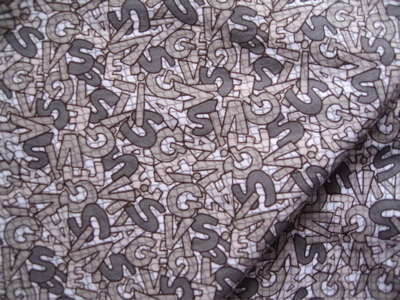 A dress made from this fabric would be perfect for the bloggie awards to to an EFF event! I saw this fabric at the store and thought of you.